The rather nice coincidence of my birthday and some MG racing at the local circuit meant there was only one place to be this Saturday! The day was organised by the Darlington and District Motor Club at Croft Circuit and featured a mix of Mazda MX-5, saloon car and MGOC and MGCC sponsored races, including the Cockshoot Cup. 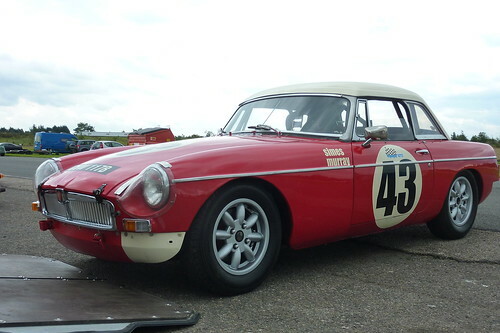 The main point of interest for me of course were the older cars in the two MG races. After a look around the pit areas we watched various Bs, Midgets and even a couple of very nice looking MGAs run around the track. One of the B racers, Kevin Broadley, has his own site where he outlines the many modifications he's made to race-prep his car - worth checking out to see what goes into these races. He also posts videos from inside his car while racing if you fancy checking out the races from his point-of-view.